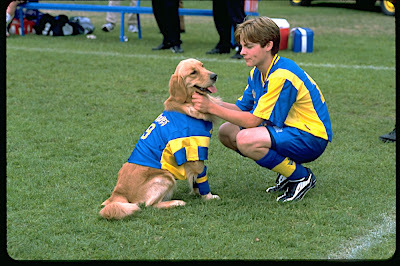 It’s only fitting that the third installment of Air Bud opens with a wedding since we soon discover that love is in the air for our two returning leads – Kevin Zegers’ Josh Framm and his loyal, athletically inclined golden retriever Buddy. 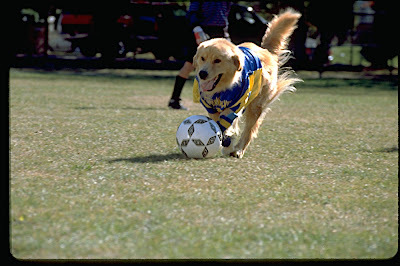 And to the movie’s convenience and good fortune, both Josh and Buddy fall for new residents from the exact same family in the form of gifted British soccer player Emma Putter (Brittany Paige Bouck) and her own retriever Molly. Eager to impress the outgoing blonde who also serves as the soccer coach for Josh’s sister Andrea’s team, Josh nervously joins the school’s soccer team and Buddy follows suit, donning the Timberwolves uniform once more when Josh’s classmates needs an extra player. 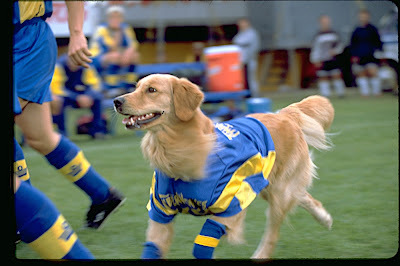 Although admittedly as the first movie in Disney’s popular franchise to be released directly to video, Air Bud: World Pup isn’t quite as emotionally compelling as the heartfelt original and its satisfying sequel, nonetheless and aside from a weak villainous subplot, it holds our attention right from the start thanks to its upbeat approach and likable cast that include several newcomers taking on previously established roles. Possibly anticipating the fact that by this entry we’re beginning to realize that perhaps Zegers’ Josh is getting to be a little too old to play sports with his canine sidekick, the film’s screenwriters Mick Whiting, Robert Vince and Anne Vince step up the role of sister Andrea (Caitlin Wachs) considerably so that she’s one of the first characters to recognize just how much Buddy has been escaping into the night to go see his girlfriend Molly. Similarly, the movie sets up the next evolution for the series with the arrival of the adorable puppies that would become the stars of Disney’s even more popular spin-off as the Buddies. 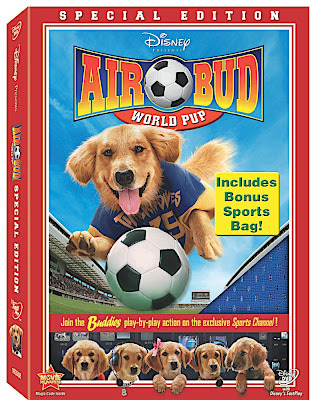 And in an effort to tie together the two generations of films for this special edition DVD that includes a free sports cinch bag, the studio inserted an extra feature previously included on the re-releases of the first two films dubbed “The Buddies’ Sports Channel,” that allows the puppies to offer a play-by-play analysis of their father’s performance on the field.